Home / News / Sen. Gordon on Lascañas: We are not gonna go back to the Senate and investigate again! Sen. Gordon on Lascañas: We are not gonna go back to the Senate and investigate again! 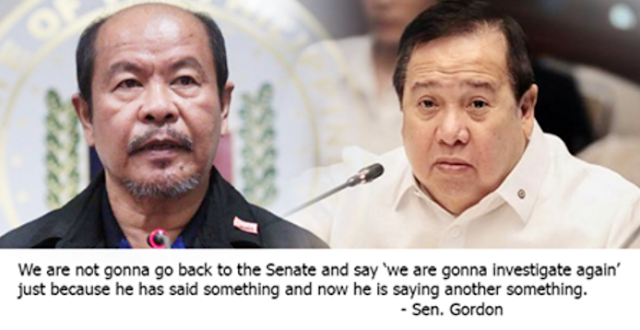 According to Senator Richard Gordon, he will no longer make another Senate probe amid retired SPO3 Arthur Lascanas claimed that Davao Death Squad (DDS) do really exist. Last October 2016 Senate hearing, Lascanas denied Motabato’s claims that DDS exist. Sen. Gordon said that because Lascanas already made his statement recently, he won’t waste the time in investigating it all over again. “He has already appeared before the Senate and he said the Davao [Death] Squad did not exist…and therefore why should I call the committee again? How would I know if he is telling the truth this time?” Gordon said. “We are not gonna go back to the Senate and say ‘we are gonna investigate again’ just because he has said something and now he is saying another something,” he added. “As far as I’m concerned, we’re done with that. If they feel that they really have evidence against the Davao Death Squad, they should go to court,” Gordon said. “I don’t know what’s happening with the De Lima case but it has been said that she is gonna be arrested today and all of a sudden, there are a couple of successive statements made by certain personalities that are really highfalutin,” Gordon said. “I don’t think we should waste the time of the Senate anymore because these are strange times, people suddenly change their minds, especially on crucial times,” he added.